An early explorer, Louis de Bougainville called the Samoan islands the Navigator's Islands, and some early government reports may refer to American Samoa as Eastern Samoa. Location and Geography. American Samoa is part of the greater Samoan archipelago in the South Pacific half-way between Hawaii and New Zealand. The four western islands constitute the independent nation of Western Samoa (now "Samoa"). In American Samoa, an unincorporated territory only 76.1 square miles (197 square kilometers) in area, the largest island is Tutuila, the administrative center. Just offshore is Aunu'u, and sixty miles to the east is the Manu'a Group: Ofu, Olosega, and Ta'ū. The most remote parts are two atolls, Swain's Island and Rose Island. The main islands are of volcanic origin, with low coastal areas, fringe reefs, and sand beaches where most villages are located. The land rises abruptly to highland ridges with mountain summits as high as 3000 feet. In this tropical climate, vegetation is dense, and mountain slopes are heavily wooded. Demography. The population has been projected to be sixty-five thousand in the year 2000, a 69 percent increase since 1960. This population is 89 percent Samoan, 3.7 percent Tongan, and about 2 percent white (mostly Americans). The remaining 5 percent are small subgroups from other Pacific islands, Asians, and groups of mixed heritage. The increase in population since 1960 can be attributed to improved health care and sanitation, a high birthrate, reduced infant mortality, increased life expectancy, and immigration. Linguistic Affiliation. The Samoan language is part of the Austronesian linguistic family. The Samoic subgroup includes Samoan and the languages of Tokelau and Tuvalu. Samoan is spoken at home, but most residents also speak English. English is taught in schools from the early grades, and the 1990 census reported that fewer than a thousand people age five or older did not speak English. Symbolism. Fa'aSamoa, "the Samoan way," encompasses attitudes, beliefs, and traditions that symbolize a world view, shared throughout the archipelago. It is their explanation of the appropriate way to live. Emergence of the Nation. The ancestors of present-day Samoans moved out of Southeast Asia and settled in islands just west of Samoa as early as 1500 B . C . E . They arrived on a double hulled sailing craft with domesticated plants (taro and yams), pigs, chickens, and dogs, as well as pottery known as lapita ware. By the first century A . D ., these people began moving into Samoa and Tonga. Early contact between Europeans and Samoans occurred in 1722, when the Dutch navigator Jacob Roggeveen's ships called at Ta'ū, followed by French explorers in 1768 and in 1787. Charles Wilkes, commander of the United States Exploring Expedition, observed the culture in 1839 and established a permanent relationship with the Samoans. 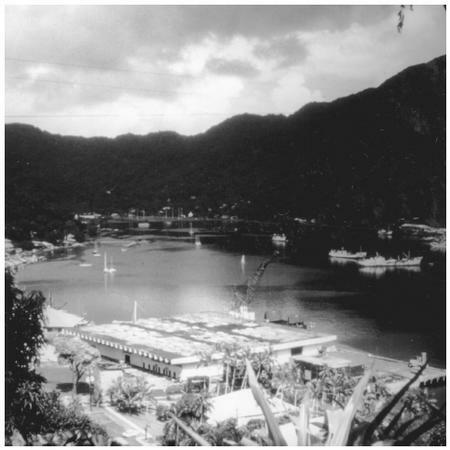 In the 1800s, Pago Pago's well-protected harbor was a popular port for American whaling ships. 1904, the Manu'a group was added when a similar treaty was signed by their king. National Identity. U. S. Navy administration was never oppressive. Samoan customs were preserved if not in conflict with U.S. laws. Hereditary chiefs and talking chiefs were allowed to retain their own forms of assemblage to deal with local political affairs. Naval officers served as governors until 1951, when the U. S. Department of the Interior assumed responsibility and governors were appointed by the President. Since 1978, governors have been elected by the Samoan people. Native born American Samoans are U. S. nationals and are free to travel between the two countries and reside in either. Samoans take pride in their status as a U. S. territory and seem uninterested in independence. Ethnic Relations. The American population has never been large, but Americans have held important positions in government agencies and the public school system. Some intermarriage has occurred, and Americans who become long-term residents tend to adapt to the Samoan way of life. Since 1951, there has been an increased flow of Samoan migrants to the United States, where they have established their own churches and often maintain a Samoan lifestyle. Until the twentieth century, the lifestyle was rural, and this remains the case in outlying islands and most villages outside Pago Pago Bay. Urban development around the bay and near the airport has a small-town quality. Until the 1950s, traditional houses ( fale ) were oval structures with floors of coral pebbles and round wooden posts supporting a beehive-shaped roof covered with sugarcane thatch. Those very open houses were well adapted to the tropical environment and fostered interaction with passers-by. Privacy was and still is minimal. Most families had a house for sleeping and a small cook house in the back, and some had a guest house for entertaining visitors. Since the 1970s, the American government has promoted the building of concrete "hurricane houses" with corrugated metal roofs to minimize storm damage. These rectangular structures are more enclosed, with doors, windows, and sometimes room partitions. Other houses are built of wood or brick. Furnishings in traditional houses were minimal—mats for sitting and sleeping and little else—but some modern houses are fully furnished, and most have television, and telephones. Legislative buildings are designed in the traditional oval shape, as are public school buildings, the farmer's market, and parts of the airport terminal building. Some commercial buildings now reflect American architectural designs. Fale houses in the village of Fituita. Fale homes were traditionally built with coral pebbles for flooring and sugarcane roof thatch. Food in Daily Life. Staples of the diet remain taro, breadfruit, bananas, coconuts, papayas, mangoes, some chicken, pork, canned corned beef (pisupo) and seafood. Onions, potatoes, lettuce, cabbages, carrots, beans, and tomatoes are also eaten occasionally. Supermarkets carry most foods found in a U.S. market. In the past, meals were eaten at midmorning and early evening. Food is cooked but may be served cold. Traditionally, most families ate while seated on mats on the floor and many still do. Elders and guests are always served first; children and the women often eat later. With changes in work patterns, three meals daily are now typical. Most restaurants on Tutuila specialize in American and other foreign foods, but a few offer more traditional Samoan foods. Food Customs at Ceremonial Occasions. Foods served on ceremonial occasions include daily fare plus whole pigs, potato salad, chop suey, puddings, cakes, and ice cream. Palusami (coconut cream bundled in young taro leaves) has become a treat for special occasions. A great quantity of food is served at special events, with guests being expected to eat a portion and take the rest home to share with their households. Kava , a nonalcoholic, mildly narcotic drink, is served to chiefs on ceremonial occasions. Basic Economy. In this traditionally agricultural country, only 989 farms ("plantations") produced for family consumption in 1990 and 137 produced crops for sale. Two-thirds of these farms have less than five acres. U. S. currency is used in American Samoa. Imports include food, fuel, raw materials for manufacturers, building materials, and mechanical equipment. In 1996, $471 million in goods was imported primarily from the United States, with exports of $313 million. The government employs 30 percent of the workforce, the tuna canneries employ 33 percent; the remaining 37 percent fill service, professional, and laborer positions. About 56 percent of families live below the poverty level. Land Tenure and Property. With the exception of small amounts of government and church property, most land is owned by Samoans. Traditionally, communal ownership was by 'aiga and was controlled by the matai. This remains true for much land. Some whites married to Samoan women acquired individual ownership of land before the 1930s, when the U. S. Navy outlawed land sales. 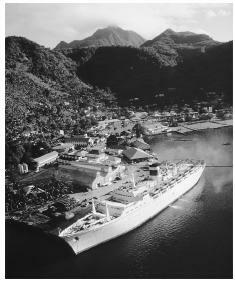 A cruise ship moored at Pago Pago. Visitors to American Samoa help boost the local economy. Individual land purchases now are restricted to persons with at least 50 percent Samoan blood. Commercial Activities. Most commerce is based on the sale of imported products. The most common retail trade establishments are places to eat (over 100) and grocery stores (nearly 200), particularly small family-owned general stores. Major Industries. The largest industry is fish processing and canning, with pet food as a by-product. Canned tuna, shipped to the United States, accounts for 94 percent of exports. There is also a garment industry, whose products represent 4 percent of exports. Division of Labor. Age is an important determinant of work roles, with young people engaging in strenuous activities while the elderly play a more sedentary, supervisory and educational role. Children have household responsibilities while leadership roles are given to middle-aged or older persons. In the past some people had specialized skills in building traditional boats and houses, fishing, and medicine. Classes and Castes. There is no true class system in American Samoa. Chiefs' titles are ranked to some degree based on centuries old traditions. These titles belong to specific families ('aiga), and some are ranked higher and are more respected than others. This is primarily significant ceremonially and determines seating in the fono (village council) and the order in which kava is served, but all have an equal opportunity to speak. Any male can aspire to be a matai, since titles are acquired through a democratic process of election by their aiga . Government. The governor and lieutenant governor are elected by popular vote for a four-year term. There are two legislative bodies: a Senate of eighteen chiefs (matai) , selected by the paramount chiefs of each county, and the House of Representatives, with one member from each of twenty-one legislative districts, chosen by popular vote. American Samoa is represented in the U. S. House of Representatives by a nonvoting delegate. The government is funded in part by local taxes, but the United States provides over 60 percent of funding through grants. Leadership and Political Officials. Village leadership is the function of the village council (fono), made up of the matai of each household. One becomes a matai through service to the family, knowledge of Samoan customs, and personal qualities such as diplomacy, intelligence, and speaking skills. Higher education, experience dealing with non-Samoans, and economic success may also be important. Political campaigns for higher offices may involve American-style rallies and fund-raising events, and candidates for governor tend to identify with the Democratic and Republican parties. Social Problems and Control. A police department handles routine law enforcement, and the legal system is similar to that of the United States. An attorney general is responsible for criminal prosecution, environmental enforcement, consumer protection, immigration, land disputes and disputes over chiefly titles. The High Court has nine judges, including the Chief Justice. The most common crimes are disorderly conduct, assault, burglary, driving under the influence of alcohol, and property damage. Sexual offenses and murder are relatively infrequent. A group of Samoan men prepare an earth oven for use. In traditional Samoan culture, men were responsible for daily cooking and preparation of special events. Military Activity. American Samoa has no standing military. The United States maintains a Coast Guard Unit on Tutuila, and sends recruiters for various branches of service to Pago Pago. Samoans can enlist in the military, and it is a popular career option. They leave Samoa for training and service. The Department of Human and Social Services administers federally funded programs that include disability services, foster care, child care subsidies and provider training, drug and alcohol counseling, and vocational rehabilitation. The largest programs provide nutritional education and assistance to the elderly and the WIC (Women, Infants and Children) program for low-income women and children up to age five. Villages often have an organization of chiefs' wives. This "women's committee" entertains important visitors and raises money for causes such as equipping village medical clinics and church schools. Untitled men in villages are organized into a cooperative work group called the aumaga that has important ceremonial and labor responsibilities. It is called the "strength of the village," and the leader (usually the son of a high-ranking chief), functions ceremonially as the "village prince," the manaia . The aualuma is the organization of unmarried women and widows. It engages in communal labor activities, entertains guests, and its members serve as attendants to the "village ceremonial princess," the taupou . Division of Labor by Gender. Before the transition to a cash economy, men were responsible for heavy agricultural work, fishing, and house construction. Young men cooked much of the daily food and did the cooking and serving at ceremonial events. Women's activities included sewing, weaving floor and sleeping mats, laundry, child care, and later cooking with modern appliances. Nursing has long been an acceptable role for women. Many of these traditional roles continue today, but new options are important. Men and women now work in tuna canneries, banks, stores, tourist-related businesses, and the school system. Men work in construction, transportation, shipping, and government agencies. 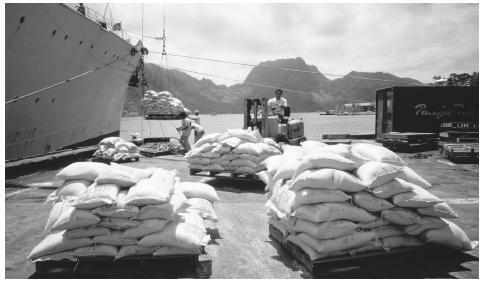 Imported rice is unloaded in Pago Pago. American Samoa imports many goods, including food, fuel, and building materials. The Relative Status of Women and Men. Historically, Samoa has been a male-dominated society. Women exert a great deal of behind-the-scenes power. Professional and authoritative positions are held mostly by men, but women occupy important roles in some government agencies and businesses and in some cases serve as matai. Marriage. Young people choose their marriage partners, but marriage is primarily an economic alliance between families. In earlier times, high chiefs' sons married high chiefs' daughters, and lower status couples often eloped. One cannot date or marry a blood relative. Nearly everyone marries, usually in the middle to late twenties, and weddings involve elaborate gift exchanges between the two families. Divorce is rare, but remarriage is fairly common among younger people. Domestic Unit. The household averages seven people and consists of one or more nuclear families and some collateral relatives. It tends to involve three generations and is flexible in composition. The occupants are related through blood, marriage, and adoption. After marriage, couples settle either in the household of the bride or the groom, each of which is headed by a matai. All social and economic activities are under the control of the matai, who is usually a male. Kin Groups. The largest kin group is the 'aiga, which includes all individuals tracing kinship to a common ancestor. This extended family may have households in different parts of a village or in several villages. The matai of these households exercise various levels of authority within the 'aiga. Matai are members of the village council (fono) which is a regulatory and decision-making body for the community. A matai settles family squabbles and makes decisions about the family's financial contributions to weddings, funerals, and church donations. The entire 'aiga interacts primarily at weddings, funerals, elections and installations of matai, and family emergencies. Infant Care. Infants receive a great deal of affection and attention and are held and carried during the first year of life. The household usually includes a grandmother, who often serves as primary babysitter. Babies are fed when hungry and sleep where and when they doze off. A high school auditorium in Utulei, on the island of Tutuila. American Samoa offers educational programs for preschool children, as well as universal public education through high school. the household and often by an older sibling. From an early age, obedience and respect for age and authority are encouraged. There is an educational program for preschool children and universal public school education through high school. There are a few parochial schools. Higher Education. American Samoa Community College on Tutuila offers associate-level degrees. Most students major in liberal arts, teacher education, and business. Some students attend college in the United States. About seven percent of the population age twenty-five and older have a bachelor's or more advanced degree. Samoans are meticulous about courtesy, particularly toward the elderly and holders of chiefly titles. One does not stand while others are seated, and if one enters a room where others are sitting on the floor, it is proper to bend slightly and say "Tulouna" ("excuse me"). A respect vocabulary is used when speaking to chiefs. Reciprocal courtesy and etiquette are characteristic at ceremonial and political events. Religious Beliefs. Before the arrival of missionaries in 1830, Tagaloa was recognized as the creator of the islands and their people and matai served as family religious leaders. The first missionaries represented the London Missionary Society, called LMS by Samoans and still used to identify that denomination. 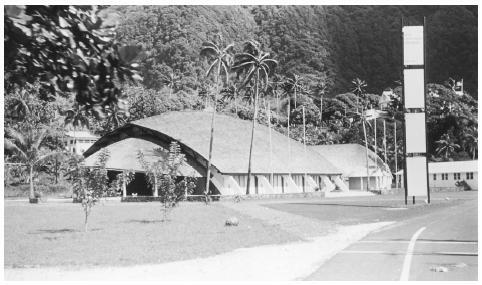 Known today as the Congregational Christian Church of American Samoa, it ministers to fifty percent of the population, while the Catholic Church claims twenty percent and Mormon, Methodist, and Pentecostal churches serve the remaining thirty percent. Samoans are faithful churchgoers and generous supporters of village churches and pastors. Religious Practitioners. With the exception of the Catholic Church, which usually includes a few Caucasians among its leaders, most denominations have Samoan religious leaders. A village council meeting of chiefs. In American Samoa, village leadership is the function of a council made up of the chiefs, or matai, of each household. and attracts visitors from nearby islands and the United States. The second Sunday in October is White Sunday, when church services are conducted by children, who sing, recite Bible verses, and present plays. All wear new white clothing. After church the children are served a meal at home featuring special foods. Death and the Afterlife. Death is viewed as being "God's will." The traditional belief that dying away from home leads to one's spirit causing trouble for survivors persists. Until the 1980s, funerals were the day after death. Developments of mortuary services allows delayed burial to accommodate overseas relatives. Gifts are given to the family, and burial is done on family land. American Samoa is a relatively healthy place, but hypertension and obesity are significant health problems in the population. Leading causes of death are heart disease, cancer, and cerebrovascular disease. A hospital on Tutuila provides medical, surgical, obstetric, pediatric, and emergency care. More limited services are available at several small clinics, usually staffed by nurses, in a few outlying villages. Local air service is used to transport seriously ill people from Manua'a. There is limited reliance on traditional healers (bush medicine), particularly for ailments known before European contact. Flag Day is celebrated on 17 April to commemorate the raising of the American flag over American Samoa in 1900, when the islands became a U.S. territory. Activities include traditional group dancing and singing, speeches, cricket games, and races in long canoes, each with about 50 oarsmen. Support for the Arts. The Arts Council and the Government Museum support art instruction for children and adults and subsidize traditional artists to perpetuate traditional arts. Literature. Oratory is a valued tradition, and a vast body of mythology, legends and poetry survives through use by talking chiefs in village council deliberations and speeches at ceremonial occasions. A panoramic view of Pago Pago Bay, a central point for commercial shipping in American Samoa. exchanged on ceremonial occasions. 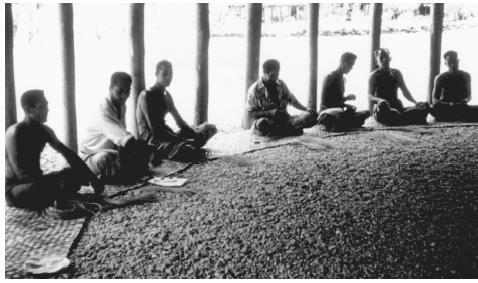 Production of siapo and finemats is increasingly rare. At one time being tattooed was a male requirement for aumage membership or to qualify for a chief's title. Practice of this art has long been forbidden in American Samoa, but renewed interest in recent years attracts young men to the former Western Samoa for the elaborate knee-to-upper-abdomen tattoos. Performance Arts. Group singing and dancing are common art forms. Large dance groups of men or women perform movements in unison with hand claps and body slaps. Solo dances are performed by the village ceremonial princess ( taupou ), sometimes flanked by male support dancers. American Samoa government. American Samoa Statistical Yearbook, 1996. Baker, Paul, J. Hanna, and T. Baker. The Changing Samoans, 1986. 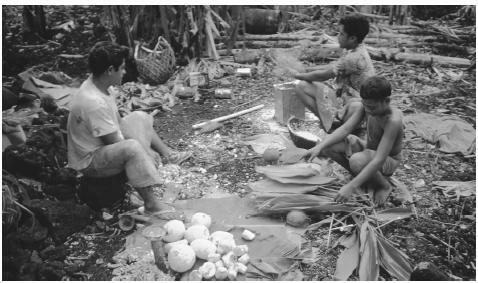 Bindon, James R. "Dietary and Social Choices in American Samoa." The World and I, May: 1986, pp.174–185. —, Amy Knight, and William Dressler. "Social Context and Psychosocial Influences on Blood Pressure among American Samoans." American Journal of Physical Anthropology 103: (May):7–18, 1994. Cote, James. Adolescent Storm and Stress: An Evaluation of the Mead-Freeman Controversy, 1994. Gray, J. A. C. Amerika Samoa, 1960. Holmes, Lowell D. "The Function of Kava in Modern Samoan Culture." In Efron, D. H., ed., Ethnopharmacologic Search For Psychoactive Drugs, 107–118, 1967. ——. "Samoan Oratory." Journal of American Folklore, 82:342–355, 1969. —— and Ellen Rhoads Holmes. 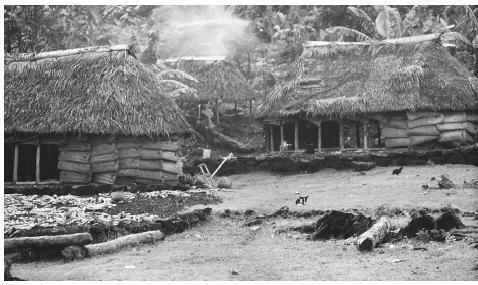 Samoan Village: Then and Now , 2nd ed., 1992. Mead, Margaret. Coming of Age in Samoa, 1943. ——. Social Organization of Manu'a, 2nd ed., 1969. Oliver, Douglas. The Pacific Islands , 3rd ed., 1989. U.S. Bureau of the Census. Statistical Abstract of the United States, 1998. Whistler, W. Arthur. Samoan Herbal Medicine, 1996. This article was a great source of info. It is always great to read, or hear about our Culture. how do you use sugarcane for roofing? tops or trash or just leaves after harvest? I have just recently met a Samoan man in Michigan. So I am learning online as much as I can about the culture. He is so very gentlemen like and has unbelievable charisma! Malo li uso e. Fa'afetai lava mo le information. Thank you for posting it up in the first place. I am a youth writing an article about White Sunday and I was trying to find as much information about the history of White Sunday. I am a Samoan girl who knows the meaning of White Sunday. Anyway, thank you and let's not forget to keep Samoa and the other southern islands that have been hit by the tsunami in our prayers. Fa'afetai lava ma manuia le aso. American Samoa was rich! wish i was born by that time:)I learn alot from my elders! my grandfather is from Alofau and my other grandfather is from Aunu'u...Proud to be samoan! This article is fabulous and amazing. Im doing my project about our culture and I found this website and it really helped me for what im doing for my I-search paper. Im so happy that i read through all of this info about our culture. Im a Samoan grl and i go to Fortuna Union High School in Cali.Thanx anyways for this good info about the Samoan history and culture. Oh my gosh!Samoa was so great in the past.Believe it or not American Samoa is great.Because there's not much supplies or shelter for every single one of us but American are helping.Us Samoan are under United states of American. Its great that these information have brought it out to us Samoans so that we could know what to the past. Surely we know about samoans but not much at all.Thank You reseachers. Im PRouD tuH b A SAMOAN. I want to know why does cultural and beliefs are revelant to the highset rate of obesity in American Samoa? Lovely summary of the peopel and culture of Samoa. Can any one volunteer and help me get a link person to discuss cultural relationship with "Samoa" I would be so happy for your support. Thank you. We were told to study a pacific island country and i was given this country american samoa to study and present on it. after carrying out a few study about this country i alrealdy feel like a american samoan and if i was given a chance to visit this lovely island, i will be able to believe it myself all the wonderful things that i have studied so far. I am fascinated with the culture of the Samoan people. I am a retired superintendent of schools from districts in California. My son was employed as an athletic trainer by the Los Angeles Ram's professional football team before they moved the franchise to St. Louis. He became quite close to several Samoan players from Brigham Young University who were trying out in an attempt to make the Ram's roster. He was invited to the Samoan celebrations and remained close to the players for many years. He often talks of the passion and warmth of the Samoan people and families he met during those years. He is now a physician and often speaks of his desire to visit Samoa. Since retirement, I have traveled extensively and most recently worked as a non-medical volunteer for Operation Smile in Cebu City, Republic of the Philippines. I have recently authored a book titled Delia's Promise (available through Lulu.com)in which I describe the culture of the Filipino people through the eyes of a Filipino child. Tonight I watched a compelling piece about American Samoa on Sixty Minutes. I was concerned that the fishibg and cannery industries are closing and it will possibly create a serious employment and economic void in the Samoan population which already suffers a low family income dilema. Combined with the closing of these industries and a recent tsunami, the country appears to face serious economic, educational and societal issues. I had a vision tonight. Please understand that I am not a radical zealot in any manner of my life's experience, but I was greatly impressed with the values described on the programming tonight regarding the deep respect young people had for their families and elders and the warmth and devotion of the people presented by the Sixty Minute producers. My so-called vision included the potential opportunity to parley the high visibility of Samoan college and NFL players and the excitement they produce among American sports fans to bring to Samoa an industry of recognition, support and funding of educational opportunities for Samaon youth. There are three NFL teams in California: The San Diego Chargers, the San Franscisco Forty-niners and the Oakland Raiders. If those franchises were contacted with the proposition of participating in the funding of schools, playing facilities and equipment for the development of Sasmoan youth,, with the advantage of having these franchises recognized by the Samoan people for their generosity and support of the Samoan people, those franchises very well might become the recognized agencies and organuzations that promote not only the support and develpment for the remarkable athletic talents of the Samoan young men but also recognized for the creation of good physical facilities to support all athletic activities for Samoan youth but also the enhancement of acadimic programs in the public schools of Samoa. The natural evolution of such a relationship of these NFL franchises and Samoan youth would create a loyalty of the the franchises to recruit the talents of future NFL Samoan football players. Importing excellent teachers and staff to work in Samoan schools has great potential. I serves as a personnel officer in public schools and I am experienced in the recuiting of teachers and administrators. I am also an avid sports enthusiast and I have received awards and recognition for my work with our students here in California. It is my intention to visit American Samoa very soon and I would be interested in meeting anyone in the administration who would be willing to meet with me to discuss these ideas. From such dreams and ideas often comes progress and hope. I am not interested in any remuneration for my efforts, just an exciting personal interest in the process of creating a synergistic opportunity which just might result in enhanced opportunities for the young people of American Samoa. Beautiful! It is always such a thrill to refresh or to learn much more about our humble beginnings of our People, Culture as well as our Religious beliefs. We are definitely a "Proud People". But I believe, we as American Samoans do deeply believe our motto of "SAMOA MUAMUA LE ATUA". I love this article im samoan and i love to learn about my culture. Faafetai and a BIG faamalo to you for this article, I enjoyed reading through how our Samoan culture and how it became a true survivor in the past. May the good Lord bless you with all the good work you have done. Hi, I am doing an research about the loss of the samoan culture.What are three ways people are loosing their culture? As a white male considering moving his family (wife & 3rd kid on the way) over to Samoa to escape the "Race" of the "East Coast" (USA) would it be safe to say there is some major racism over there towards white educated people? I'd love to think I could move there and have no worries whatsoever, as my brother & mom did in Kauai for 8yrs, but is this realistic? I'm heading to Samoa fyi, not American Samoa, is this a huge difference as well? HI, AS A STUDENT STUDING CULTURE, MARRIAGE AND KINSHIP, IAM VERY HAPPY FINDING SUCH INFORMATION PROVIDED IN THIS WEB,CONGRATULATION TO WHO PROVIDED SUCH. JUST A REQUEST IF YOU CAN PROVIDE SPECIFIC INFORMATION FOR CERTAIN COUNTRIES. samoan people are known for their hospitality. as for you pierre, the roofing is done with patches of coconut leaves attached togethere. sometimes with laufala. believe it or not the thathings are water proof and make good coverings. I was adopted as a new born, my dad is a American Samoan, i love reading about my culture, i will be visiting Samoa soon. Reading this article as helped me better understand the many cultures in our world. I am 17 and i am currently living in albuquerque,NM at a school called :Albuquerque Job Corps: every month we have a new culture to learn about, my father told me that one of my grandparents were Samoan so reading this article just made me want to learn more. I told my Instructor and my mentor that I wished to do a presentation on the pacific islands but most importantly on AMERICAN SAMOA. They debated it and now its safe to say that next year more people will be more aware on this Beautiful culture. Thank You For Posting. Talofa lava! This is the most truthful and beautiful illustration of the Samoan Island and culture. I'm thankful for the information you've provided and I am forever proud of my heritage! I am a Samoan whose been away from Samoa for too long. My future husband is Palagi (American,French Cajun) and this article helps him learn about my Samoan culture as well. Fa'afetai Tele for your work on this. Manuia lava!! Thank you for this very informative article. I need some guidance - I am going to American Samoa on business in a few weeks and need to know how to dress appropriately for the meetings. I am a 61 year old Caucasian woman, and widowed, Would it be acceptable to wear lava lava to business meetings and a training for community healt care groups that my company is offering? I would also wear a light jacket or scarf to cover my shoulders. Would the Samoans appreciate this style of dress or find it objectionable or ridiculous on me? Nice article. I am looking for more old pictures of Manu'a, mostly Sili. Thanks for sharing this info. and especially the photos. MY BEAUTIFUL MANU'A!! My samoan culture is very beautiful and proud of it,and remember,it's not about american Samoa,it's about "SAMOA". I was born and race back home until i was seventeen,Im 45th now and im takeing my wife and kids to samoa on their first trip.Come's from a high chief family make's me very proud, and that's one of the reason why im takeing my kids.I want them to know how samoan way of living.oh,by the way,i thank you for the great article.TOFA SOIFUA! Thank you, for this very informational article it has taught me a lot of my culture that I didn't even know about, & now i'm proud of what i am. Im 13 years old, & I use to know nothing about American Samoa & now reading this article wants me to find out some more! I just wanna say Thanks for these very understanding and clearly information about our island. I really do appreciate it and want to find out more information about American Samoa. I will keep researching everything and the history of American Samoa. And I am PROUD to Grew Up in a Samoan Family and to become a True Samoan. I am from American Samoa. Thanks a lot for putting this article on public. And everything that this article is saying its true. American Samoa is the only place that i can find love, kind, peace, safety, and especially Home. I AM PROUD TO BE A SAMOA. American Samoa is much more funner.. We do a lot opf fun activity. This is a great article to get information for assignments or even home works for school. I really enjoyed reading this article. Great information contained in this article. I now understand "the what and why" of many of my friends. I will use some of this information in a school project I am doing. Thank you for making this information available for all. Thanks Again! This is so fascinating and awesome, cause I am taking full arts and it gave me great information's for my researches and I really enjoy and love reading it. Great information about home, I am now 65 years old and only been to Samoa one month in 2008. I left in 1968. Thanks for Culture info. I would like to say, that this article will help me understand more about our culture, and where the samoan people were from. I know that some people doesn't even know about our culture, and you can visit this website. I will make a script about our culture, so that I can acted out, and to spread our culture to other parts of the world. Thank You. Can someone tell me what to do with a tapa cloth that was a gift from a friend who is now deceased? Is it tradition to return the item to the family? If so, which family member should I attempt to return it to? All elders & brothers are now deceased & the name his only wife & child (a daughter) remain a well kept secret. I want to respect the culture & traditions of my old friend, but I am clue-less as to what to do with my stored treasure. HELP! @ Dee. There is no need for you to return the Tapa that was given to you as a gift. It is not a part of culture to return things if the person who gave it to you has passed on. If you want, you can put the Tapa cloth in a frame and hang it somewhere for the everyone to see . I really appreciate the writers for always remembering the cultural that we have. What are the everyday norms for the american Samoa culture?